Hi, and welcome to another Dev Diary! Unfortunately the TimeLapse video is a little bit late. I'm currently rendering it and the final render will be ready around midnight today (UTC +2) and it depends on the connection quality how long it will take to upload it to YouTube (plus how long YouTube will take to process the video). I estimate that the video will be up in 4 hours after publishing this devdiary. The model for Front doors, is almost ready. Eye hole and mail slot are still missing. There is not much updates on the modeling it self, as I have been busy tackling the technicalities of video processing with VirtualDub2 (more info below). 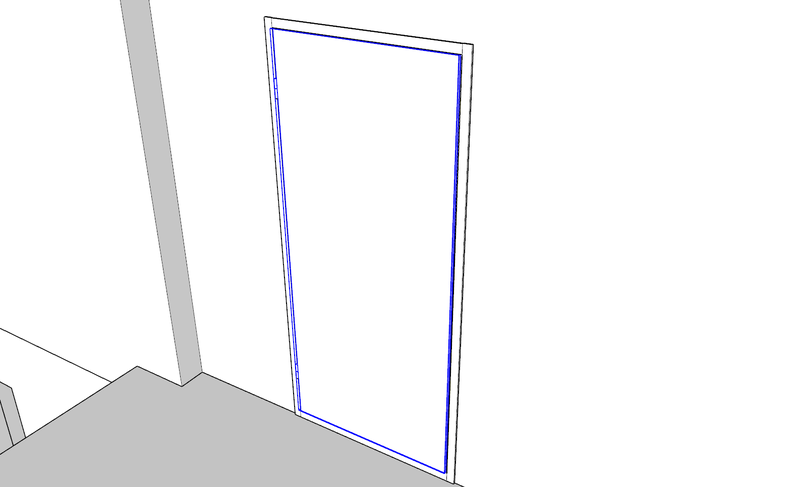 But I managed to record one video more, while making this model for the front doors and hinges for them. After the front door, I'll be tackling the room doors, windows and the door to sauna. Editing an Edition of an Edition. Since I have been experimenting with the video encoding tools while searching for a good, lossless way to edit my videos, there has been a lot of editing being going on on the first #time-lapse video. First, I have been looking for all the different kinds of plugins that are useful or essential for making a time-lapse video. The quality and success of these tryouts have varied much and I'm quite certain that I might have found the ideal combination for lossless editing, partly without a GUI. I'm also planning to release a clip of the original cut, that is a 20 minute long video (that I first planned to release) and make a Poll on what you like more, the faster paced release and shorter version, or the smoother but still quite fast paced video. Also, would it be better to release one big video with multiple songs, or measure the video lengths for the duration of the songs? I'll upload sample videos as soon as possible. As music for the videos, I chose game music remixes - maybe not the best kind of music for everyone, but it fits the theme - a gamer making a game for gamer's, who are waiting for the final product while watching a time-lapse of me making assets for the game and listening to game remix music. Gamy stuff. Sonic the Hedgehog "Gotta Start from Somewhere"
Teenage Mutant Ninja Turtles IV: Turtles in Time "Subterranean Kamikaze"
Mega Man 3 "The Passing of the Blue Crown"
I still plan on making my own music for the teaser of the Project Taival and several other videos in the future, but I can't promise a release date for those still. What i can promise though, is that I'm learning something every day, that helps this project to go forward. Thank you for tuning in again and I'll see you again on the next weeks Dev Diary! The prediction for the video completion seem to be way off - after 30 minutes my computer chocked and is now processing 22 frames per minute. For some reason, the timelapse video is the culprit, but not the newly made intro and ending parts. 1; The Adobe After Effect couldn't render the video in lossless quality, as the output video got stuck in a loop, probably due to low amount of RAM (8gb of RAM). 2; Even another program couldn't handle the whole film for some reason, even when it wasn't a RAM related problem with this particular software (VirtualDub2). Only after I first put together the first and second parts of the video, I could add the third part in and thus it took more time to process This is also why I think it wasn't because of the RAM this time - the frame count and quality didn't change. Currently I have managed to put together the whole video and the final pass is running as I'm writing this. If all goes well, the video should be up and running on the Project Taival -YouTube channel by tomorrow evening (30th of January). Always double your initial estimation for when the work is going to be complete, as you never know if something goes wrong. Both time-lapse videos are up, the faster 10 minute video with intro and ending and the comparison clip from the 20 minute video. Which one has a better pace in your opinion? Should the pace be even slower? Feel free to leave some feedback.